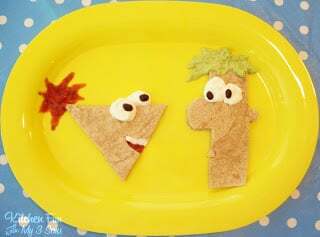 We came up with these Phineas and Ferb Quesadillas and this is so much fun to make for the kids at your Cinco de Mayo party! Cut the tortillas into the faces using kitchen scissors. Fill them with black beans & cheese. Use your sour cream and black beans for the eyes. Use your guacamole and salsa for the hair. We just put a spoon full in the middle and spread out from that with a knife. Use sour cream and salsa for the Phineas mouth. I am sure this will be a regular in this house since my boys loved these so much! You could always use lettuce or avocados for Ferb’s hair. Get creative and use what your kids like. The best part about these is that they are so easy! Very Creative Jill! My kids would have loved these I know! You've got such great ideas! How fun are these! I am going to try them (my 4 year old daughter loves Phinneas and Ferb). I will blog about them if they turn out =-) Just found you through tater tots and jello. 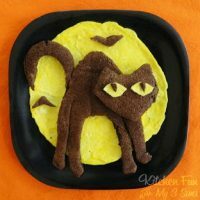 I have one food related post on my blog… I am just new at the blogging thing. Check it out…. 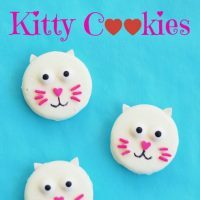 OMG…these are so cute! 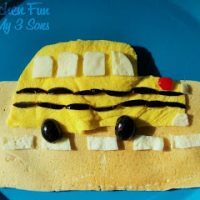 I'm planning on making them for my little guy on cinco de mayo! He's gonna flip! My 3 boys would LOVE this!! I just found your blog today and I'm loving it… I'm your newest follower! This is so stinkin cute!!! We absolutely love your Phineas and Ferb food ideas and are going to totally make these! Thanks so much for sharing. Am now following your blog! wow this is great, my son will surely love it! thanks for sharing!